When deciding upon a job for a career in the military, a prospective member of the armed forces may wonder what an armed services chaplain does. The military in the United States plays host to a wide array of different faiths, and the role of a military chaplain requires training and knowledge of many faiths and how serving in the military may impact the spiritual well-being of service members. All military service members go through some type of “basic” training when entering the military, but the initial training chaplains undergo does differ for anyone who decides to become an Army chaplain. According to the Army’s information page on a chaplain’s training, this job in the Army does not require traditional Basic Combat Training. Instead, chaplains in the Army must complete the Chaplain Basic Officer Leadership Course, which takes 12 weeks to complete and is held at a base in South Carolina. Additionally, Army chaplains begin serving as a staff officer instead of working toward that promotion over time. What an armed services chaplain does often coincides with study of a graduate degree in religious studies or theology. Chaplains may be required to earn several semester hours at the graduate level and may already need to possess a bachelor’s degree in order to gain entry into the armed services as a chaplain. A chaplain may be responsible for over 1,000 service members, so the job comes with significant responsibilities. The role of a chaplain often stretches well beyond basic conversations on religion. A chaplain must understand matters of morale and how spirituality and religion may impact a soldier’s performance on the battlefield. Depending on where a chaplain is stationed, he or she may be responsible for developing a variety of workshops, counseling sessions, and special events. Chaplains must gain an ecclesiastical endorsement from a religious organization and will minister within the canon of his or her faith. However, chaplains will very likely need to provide spiritual counseling to service members outside their faith and denomination, which requires knowledge of faiths that may be quite diverse. Additionally, chaplains may officiate official ceremonies such as funerals and memorials while also offering religious ministry to service members, as well as civilian visitors to the United States. Chaplains provide a significant amount of one-on-one counseling to service members within a variety of different circumstances. 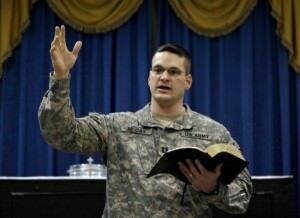 The role of a chaplain may take a service member to any number of bases on foreign and domestic soil. Chaplains are considered active duty members of the military and serve in the Marine Corps, Coast Guard, Army, Navy, and Air Force. Chaplains are found on all military bases run by the United States military, as well as within active combat zones around the world. The United States Navy suggests that chaplains must be able to minister outside of the traditional setting of a church or religious house. Military chaplains may also pursue civilian employment while serving with the National Guard or Army Reserve on a part-time basis. Anyone with an interest in becoming a chaplain in the United States military should be able to engage in meaningful discourse with other people while under the physical and mental pressures of combat. What an armed services chaplain does to help service members is extraordinarily important to the mental well-being of the nation’s military.